I am a hot chocolate lover. That’s probably a huge understatement, because it’s one of my favorite things One of those that top the list is Homemade Hot Chocolate. I grew up with hot chocolate being homemade–I don’t think I even knew what a hot chocolate packet was. 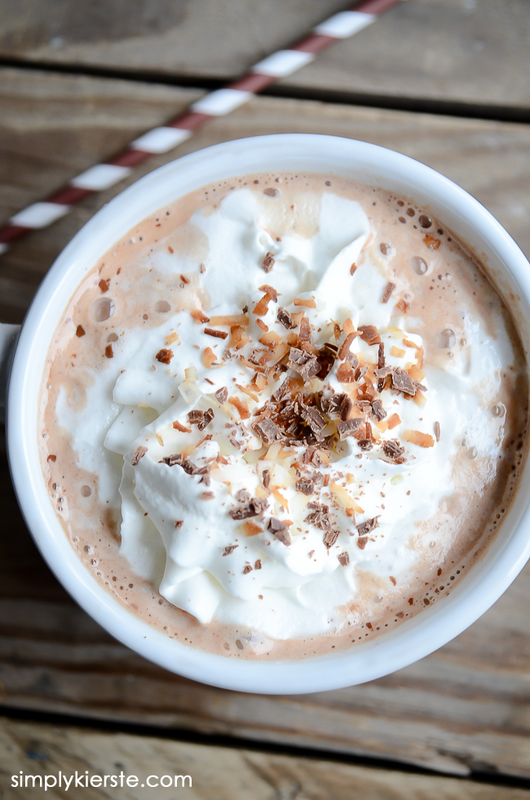 Making homemade hot chocolate doesn’t take long, and it’s SO yummy–perfect for all of those cozy evenings and holiday gatherings with family and friends! Make it in minutes! For us it’s part of our holiday celebrations–every time they come in after playing in the snow, when we make Christmas cookies, after a Christmas outing, at parties, on Christmas Eve and Christmas morning, and any other excuse we get! This recipe doesn’t take long at all to make, and everyone you serve it to will think you are a superstar. I love adding the peppermint cream on top–it’s the perfect complement for the rich & cream chocolate. If you don’t like peppermint, you can always use plain whipped cream with a little sprinkle of cinnamon & sugar (add it to the hot chocolate, and on top of the whipped cream both), with marshmallows, or plain. It’s delicious any way you serve it! In a saucepan over low heat, melt the chocolate chips with the can of evaporated milk. Once they're melted, stir in the four cups of milk and heat through. Remove from heat and add the vanilla. Serve with Peppermint Cream if desired! Peppermint Cream: In a mixing bowl, beat the heavy cream until it's just beginning to form soft peaks. Add the powdered sugar (you can do more or less to taste), and beat until incorporated. Add the peppermint extract and crushed candy canes, then beat again until the right consistency. I like to spoon the cream into a sandwich bag, push it down into one corner, snip the corner off of the bag, then pipe it onto the top of the hot chocolate. Sprinkle a few more bits of candy cane on top, and enjoy! 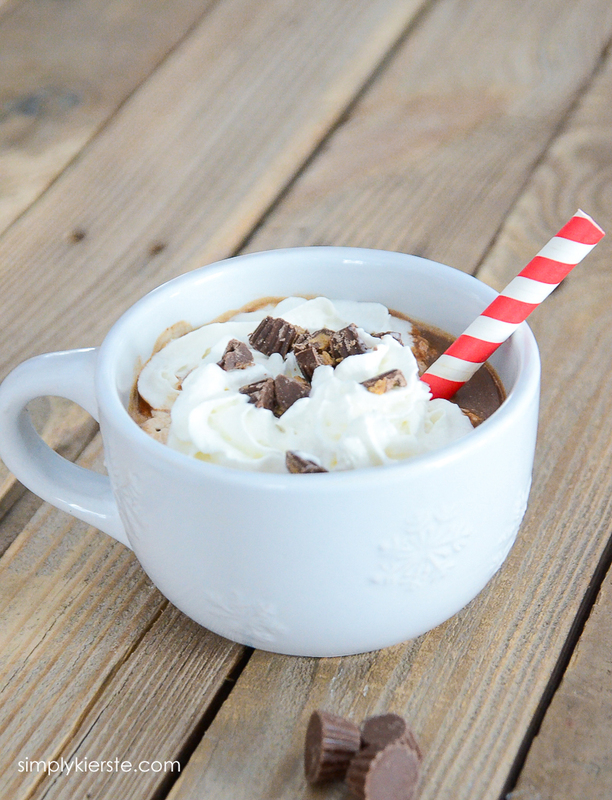 Take this same hot chocolate recipe and make these other super yummy hot chocolate flavors!! I just wanted to stop and take a moment to tell you how awesome I think you are. My husband makes fun of me because I can always spot your things (posts, crafts, etc.). Part of it is due to your kinds names and I guess the other part is just how great your stuff is. 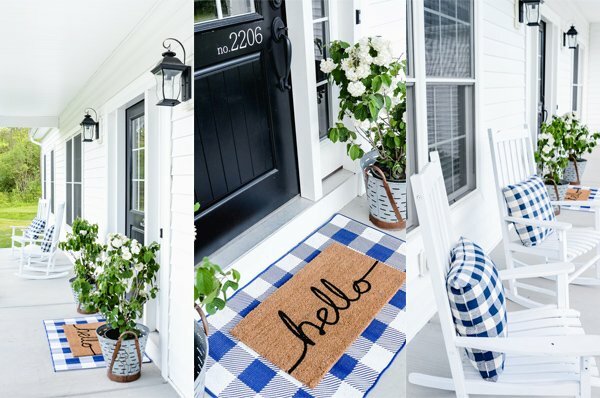 I DIY as much as I possibly can and I owe it to you and your blog. It was the first one I found and I haven’t left since. And you got me hooked on Pick Your Plum. I will stop rambling :) I just wanted to wish you a great day and let you know that I look forward to each of your posts. This recipe sounds great, and can’t wait to try it. I would also like to know where the really cute mug is from. I found that mug at our local grocery store in Michigan–it’s a Midwest chain called Meijer. I only got two and I wish I would have bought more! I made this hot chocolate for my family to drink while we put up our Christmas tree last night. It got rave reviews! Everyone agreed it was even better than Starbucks! Yay!!! I’m so glad!! !I’ve always thought so too. :) And I’m itching to get my tree up…can’t wait!!! how many cups of hot chocolate does this recipe make? Can I keep it warm in a crockpot? It looks yummy, can’t wait to try it. For my family (7 people drinking it) one batch is just about right. It makes around 6-8 servings, depending on big they are. If I have additional people coming over, I double or triple it. My kids call this Christmas Coco – and insist on it every Christmas! Thanks for sharing this and all your great ideas! Love that name!! So fun!!! Merry Christmas! Hi Kierste! My husband and I both found this recipe on the same day to make!! ? crazy! He NEVER sends me links to make! He had no idea it was you either. Question… I’m in charge of the hot cocoa station for our relief society activity next week . Any thoughts on the best way to make and serve this for say 30-50?